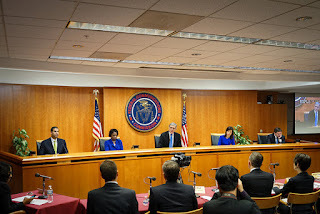 A year ago, on February 26, 2015, the Federal Communications Commission voted to restore real Net Neutrality protections for Internet users across the United States. The FCC action, reclassifying high-speed Internet access as a telecom service under Title II of the Communications Act, prohibits phone and cable companies from blocking and throttling Internet content or giving priority access to rich companies while relegating the rest of us to online slow lanes. It would be hard to overstate just how important this decision is for Internet users. After years of debate in Washington and beyond, the issue came down to one agency, and one crucial vote. In the months leading up to the February victory, more than four million people took action at the FCC, overwhelming the agency’s online comment engine. Tens of thousands more picked up the phone to urge their members of Congress to support the FCC’s effort to protect the future of the Internet. It was a win more than a decade in the making, one that was fought in Congress, at the FCC and in the courts — including the court of public opinion. On that wintry Thursday last year, Net Neutrality supporters emerged from the FCC to celebrate a stunning triumph. Our gain was a rare defeat for the cabal of powerful companies — including AT&T, Comcast and Verizon — that too often dictate communications policy to our elected officials. They’ve spent hundreds of millions of dollars on lobbyists, lawyers, think tanks and campaign contributions with one goal in mind: wresting control over digital communications from everyday Internet users. But nothing in Washington, not even a public-interest win of such magnitude, is final. Never mind that only a small circle of Powell’s industry colleagues and cohorts shared his distress. Allies in Congress got the signal and leapt into action. Less than a month after the FCC vote, the House Oversight and Government Reform Committee called a hearing to investigate whether the FCC had an improper relationship with the White House. President Obama has long been an outspoken supporter of Net Neutrality. Rather than cheering the FCC for listening to the millions of Americans who called for real Net Neutrality, House leadership claimed that the rules were the byproduct of illicit strong-arming by the president. By April 2015, Republicans in both the House and Senate had introduced a “resolution of disapproval” to protest the FCC process and overrule the order. But the resolution soon fizzled, with the GOP failing to muster the necessary support. In the summer, Republicans on the House Committee on Appropriations attempted a new line of attack, sneaking a “rider” inside the must-pass government-spending bill. The rider would have made it impossible for the FCC to enforce the rules until after court cases challenging these protections were decided. The bill stumbled forward through the summer and fall. When it came to a vote in December, the threatening language went missing, thanks in part to the thousands of Net Neutrality supporters who called their members of Congress and urged them to stop messing with Internet users’ rights. So far, failure has been a common fate of congressional efforts to kill Net Neutrality. Opposition to the idea grows weaker and weaker the further you get from Capitol Hill. Polling on the issue consistently finds strong public support for enforceable open Internet protections. This support includes a majority of Republican voters — a data point that too often has fallen on deaf ears among GOP leaders. On the legal front, ten Internet service providers and industry lobbying groups filed lawsuits against the FCC seeking to overturn the Net Neutrality protections. The companies claimed that the agency had overstepped its authority, and the rules had irreparably damaged their businesses. Yet they couldn’t point to a single instance of harm coming from the Net Neutrality decision. In fact, the opposite is true. When the Title II ruling came up during cable and phone company quarterly investor calls, the providers’ answer was the same: Net Neutrality rules hadn’t hurt their deployment or investment plans one bit. By the end of 2015, the business picture became even clearer: the largest companies — including AT&T, Comcast and Time Warner Cable — are investing in broadband at record levels. Net Neutrality be damned! In December, the case against the FCC order went before the US Court of Appeals for the DC Circuit, which consolidated the ten industry suits into one. In oral arguments before the court, Net Neutrality supporters backed the FCC and again defended the people’s rights to connect and communicate on the Internet. We’re confident that the panel of judges will agree and uphold the FCC’s ruling. The agency chose the correct legal path to protect the rights Congress preserved for all Internet users. It returned to the solid foundation of the law in Title II, crafted strong safeguards and restored protections for the open communications network that powers our democracy. At the one-year anniversary of the FCC decision, Net Neutrality advocates await the outcome of the court ruling — which is expected in the coming weeks. While the struggle to protect the open Internet is ongoing, support for Net Neutrality has only grown. Even Net Neutrality foes now pretend they support the principle. They just oppose any effort to make it enforceable. Such feeble attempts to thread the needle merely demonstrate the grassroots political power behind Net Neutrality. We’re now looking to November and hope that the next president will champion Net Neutrality with as much passion as the present one. Whatever the outcome, we know that millions will keep fighting to preserve and protect the open Internet rules we won last February. That’s a certainty Washington shouldn’t bet against.